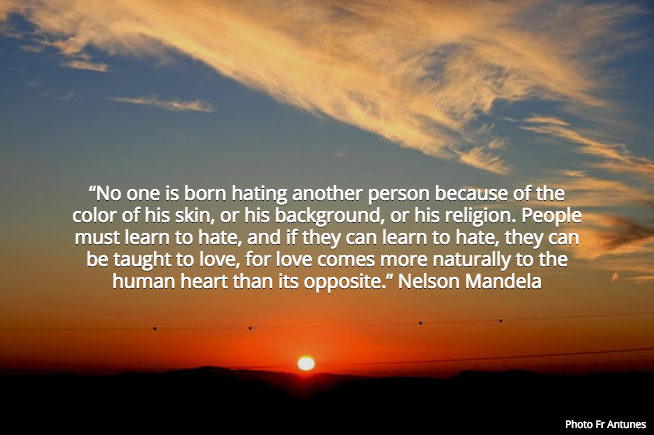 His quote is an attitude of love in the face of hatred. “Lots of folks expected us to do something strange and break out in a riot,” Goff said. “Well, they just don’t know us,” he said, as the congregation stood and cheered. The tragedy of the Charleston shooting remained in my thoughts and showed up in a poem during the dead of night. begat by fear, blame, otherness. for an end to violence. A very powerful and ultimately hopeful poem. Thank you for reading, Andrea. I like it Mona. I thought you were strictly the executive type. There’s real talent there. I enjoy discovering new facets of my being. Powerful and needed words. Thank you for sharing the amazing words and thoughts. Much appreciated. I don’t like to feel helpless when there is so much pain in our nation and world. Words can hopefully give expression to that feeling. Thank you for sharing your thoughts and this poem with your readers. If we led with concern, kindness and love. Not hate. Would be a better world. Power and wise thoughts by a talented writer. Please read and enoy her work. Thank you for sharing, Mona. I love the other four-letter words that bring about change. Sorry to be just finding this. It’s a very powerful message. Thank you. Poem is also a four-letter word! poems and poet, more beautiful four letter words; thanks for stopping by. Ah! “Poet”! Well played. Well played, indeed!